Admiral Kensington glanced across the room full of flag officers, to Vice Admiral Katrina Cornwell. The Vice Admiral was sitting opposite from Kensington, and after a moment, Kensington caught her attention. Both women nodded to one another, not saying a word but speaking volumes. The last four hours had consisted of presentations by the collective admiralty involving increasingly more complex and impossible defense strategies, whose intended purpose was to slow or stop the Klingon offensive against the Federation. None of them could be assembled in time to stave off invasion, but the two women, days before the meeting, had settled upon a simple, bold, and effective plan. Murmurs of protest were swiftly quieted as Kensington smiled, nodded to Cornwell, and stood. She spoke a single word that silenced the room as they considered its meaning. A tap of a data pad and a swift wrist movement sent a detailed battle plan up to the main screen and the assembled officers turned to examine it with the same brutal scrutiny as they had every other proposal that morning. Displayed there were tactical diagrams of Priors World. A voice soon pointed out the obvious. “A riposte is not a defensive maneuver, it is an offensive one.” Kensington did not look to the voice, but instead continued to address the room. Kensington scanned the room now as it fell silent in contemplation of her and Cornwell’s words. They’d never say it aloud, but everyone in the room preferred being the aggressor over the defender. Operation Riposte is the first major Federation offensive of the Klingon-Federation War of 2256-57. After nearly a month of crushing defeats, the Federation initiates a bold new plan to regain initiative in the war. The planet of Priors World has recently been conquered by the Klingons, but the Federation counter-attack aims to not only wrestle control of that world back into Federation hands, but also to deliver the first major defeat to the Klingons and thereby inject a much needed morale boost back into the ranks of Starfleet. You'll learn the first details of the story of our next major content update, Rise of Discovery, in Operation Riposte. It's is a Featured Task Force Operation, where Five Alliance captains will gather at Priors World, to complete the critical tasks necessary in liberating that planet from its Klingon conquerors. During the operation you will coordinate your attacks against the captured orbital defenses around Priors World and retake them. Only then will the invasion begin, as transports arrive in orbit to deliver Federation Security Forces to the planet’s surface. Keep the skies clear and ensure that enough troops land on the surface to liberate Priors World from its oppressors. This event will last for 3 weeks starting on April 18th for PC players, and on Xbox One and PlayStation 4 in mid 2019. All players level 10 and above will be able to participate, and can earn a TFO Commendation once every 20 hours. 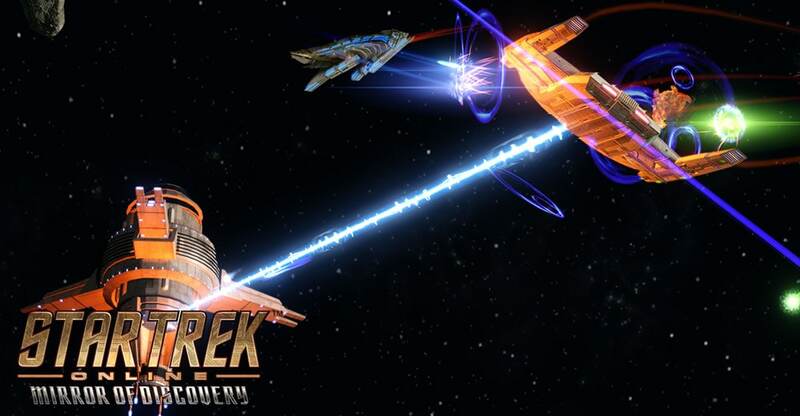 This event will also debut a brand new system for Star Trek Online. Earn progress toward a Free Ship by participating each day in the Featured TFO Events that will be running from now until Fall of 2019. By playing these three Events, you can earn Coupon Progress Tokens each day, allowing you to eventually claim a '100% Discount Coupon: Tier 6 Ship' that will allow you claim a free Tier 6 Starship of your choice from the Zen Store. When you play the 'Operation Riposte' Featured TFO Event, once per day, you will receive 50 Coupon Progress Tokens. Progress will be rewarded across your entire account, so you need only participate once per day to max out your potential progress. Keep an eye out for Featured Event Coupon Bonus Days, which will double any progress that you earn while they are active! After you've earned a total of 3000 Coupon Progress Tokens, head to the Reputation menu to claim your prize. In addition to this new program, complete the TFO on 14 different days to earn the Console - Universal - Priors World Elite Defense Satellite in addition to marks, dilithium, and three Featured TFO Reward Boxes. This box gives your choice of an Enhanced Universal Tech Upgrade or a Captain Specialization Point Box, which gives the character who opens it a Specialization Point. These boxes are account bound and may be traded via the account bank. The Console - Universal - Priors World Elite Defense Satellite may be equipped on any starship, and allows them to call a powerful stationary defense platform into play. Originally developed to defend the strategically important Federation planet known as Priors World, this defense satellite technology still holds up to this day as a valuable tool for providing both defense and offense when deployed onto the front lines of a confrontation. It is outfitted with powerful tractor emitters designed to burn out after a single use, which saves tremendously on construction and replication costs, as well as lowering power draw. These tractor emitters will latch on to enemy ships when the satellite is first deployed, corralling them toward the satellite for ease of engagement. Once its weapon systems come online (which requires several seconds), the satellite is set to constantly re-evaluate dangerous nearby targets, providing a withering barrage of multi-target covering fire for all allies in the vicinity. This console also provides a passive boost to Directed Energy Weapon Damage and Weapon Power Cost. Obtaining the Console - Universal - Priors World Elite Defense Satellite on any character on your account will unlock the ability to reclaim the item on other characters, via the Reclaim tab of the Dilithium Store. You may only reclaim this item on characters that do not already own one.